This story is the second part in a four-part series about our Halfsy Hero Robert Rieck. Our series will follow Robert and three other heroes as they train for the 2017 Good Life Halfsy. Robert Rieck knows that a lot of what happens in life is out of our hands, but when he can affect something for the better, he’s ready to get his hands dirty. At the finish line of the 2015 Good Life Halfsy, Robert had to look at those hands to know if they were connecting to the wheels of his heavy manual wheelchair. He was one of only three entrants that year pushing a chair, and the only c5 quadriplegic. 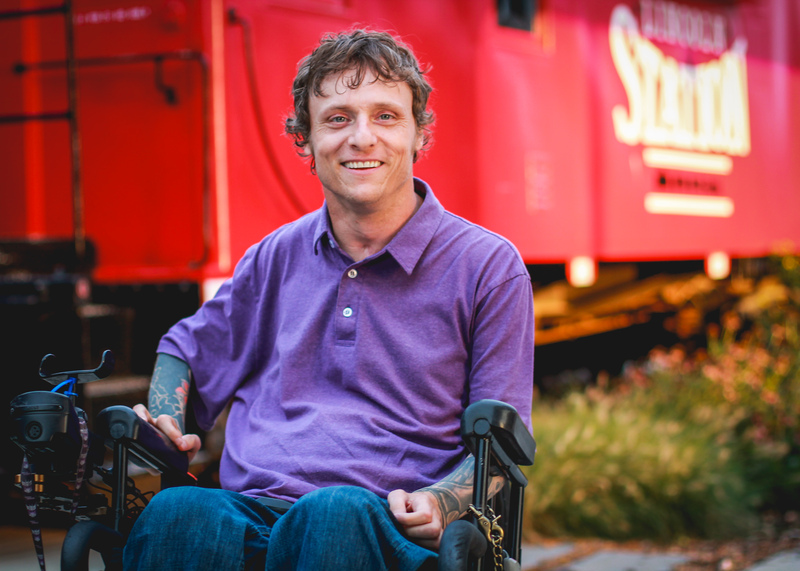 The Good Life Halfsy is about living your best life, and Robert saw an opportunity to help make the race more inclusive to those who have to try a little harder every day. Robert knew that this discouraged a lot of wheelchair athletes from entering. He prepared to battle for other Paralympians, but hardly had the chance. The race now offers 4 options for wheelchair registrants, t51, t52, t53, and t54. Now with a chance to really compete, Robert turns his focus to preparing himself. In addition to driving to Omaha weekly to participate in the brutal sport of wheelchair rugby, he trains Tuesdays, Thursdays, and Saturdays. An ethically-driven vegan, Robert gets his protein, fiber, and calcium from nutrient rich, whole foods like hemp, molasses, and raw organic meal. With the drive to change the world, and ample energy to affect it for the better, Robert’s focus is on making an impact each day. Check back for more Halfsy Hero stories, and to read the next installment of Robert’s story.